Coin Trays. Coin Dish Designed By You. Your Photos Coin And Key Tray. Say goodbye to finding coins down the back of the sofa and say hello to the personalised coin tray. Kept in the kitchen or lounge, your scratch resistant personalised coin holder is a handy accessory that keeps your loose change neat and tidy. Customise with your photos to make a unique gift or decorative tray for your own home. Available in sets from four to twelve and made from durable perplex, you can create a personalised coin tray set to suit any occasion or use. Get your loose change in order and prepare to be amazed at how much you collect with the custom coin dish. Scratch resistant and shatterproof, you don’t need to worry about old pennies making a mark on your printed money tray. Doubling up as a key holder or simply just as a decorative tray to add some colour to your home, the personalised coin tray is an excellent gift. The quality Perspex that your money tray is made from has a nice gloss to it and reflects the light. Although it’s more of a plate in style, the lipped edges help prevent coins from slipping off should it get knocked. Your photos or design are printed from edge to edge, to make a colourful, stunning decorative tray. Grandmas could use their coin holder as a sweet tray, ideal for when the grandkids come around. Busy families with kids who never seem to have change for the bus would find the coin dish a lifesaver, as they can grab the change and go without any fuss. It's so versatile, so think outside the dish! Whoever you buy the coin dish for as a gift will no doubt always have it on hand for one thing or another. Your decorative coin display trays are handmade to order with care, expertise, and passion. Using a specialist printing process, your photos are fused directly with the surface of the durable perplex material. This ensures the colours are vibrant and long-lasting. Everything is finished by hand including the packing, for a truly unique coin tray handmade with love. Care: Easy to clean, hand wash with mild soapy water. Your coin dish won’t shatter, scratch, or bend because it’s made from solid acrylic. The coin dish is a practical household item, but why shouldn't it be beautiful and colourful too? Whether you choose photos, text, or a unique design, it will look right at home on your side table. 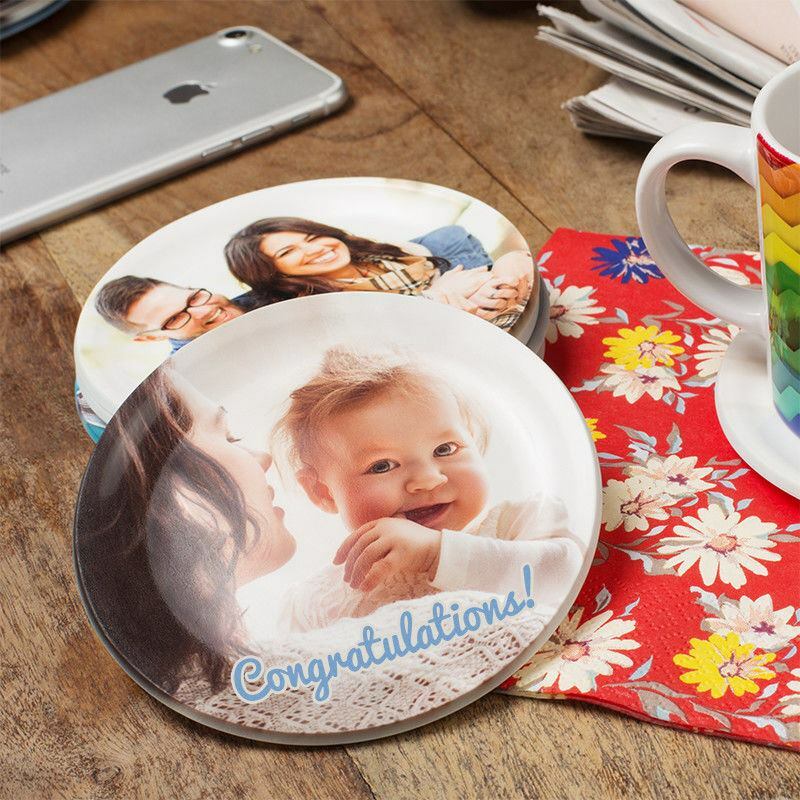 The personalised coin tray is (roughly) the size of a coaster, so we'd advise to print just one photo instead of a collage, as the smaller the photos get, the harder they'll be to see. For a loving gift to your grandma or auntie, print their beloved pet onto the dish as, after all, animals are family too right? Or if they have a favourite seaside destination, bring it to their home by printing a lovely landscape view of an iconic pier or waterfront. If you have a specific use in mind, why not follow that through with the design? If you're always misplacing change, print an image of loads of coins as a reminder to start collecting the pennies. The same goes with keys; print an image of your house keys or a fun key themed design to drill it home that the coin and key tray is where they go not left in random drawers or shelves! The coin dish is also a great way for bars and cafes to present the bill or leave on the side for tips, so print your logo or business branding for maximum awareness. Customers appreciate the little personalised touches, so as an alternative to your logo, print a sweet thank you message for their custom. Hopefully they'll turn into regulars!